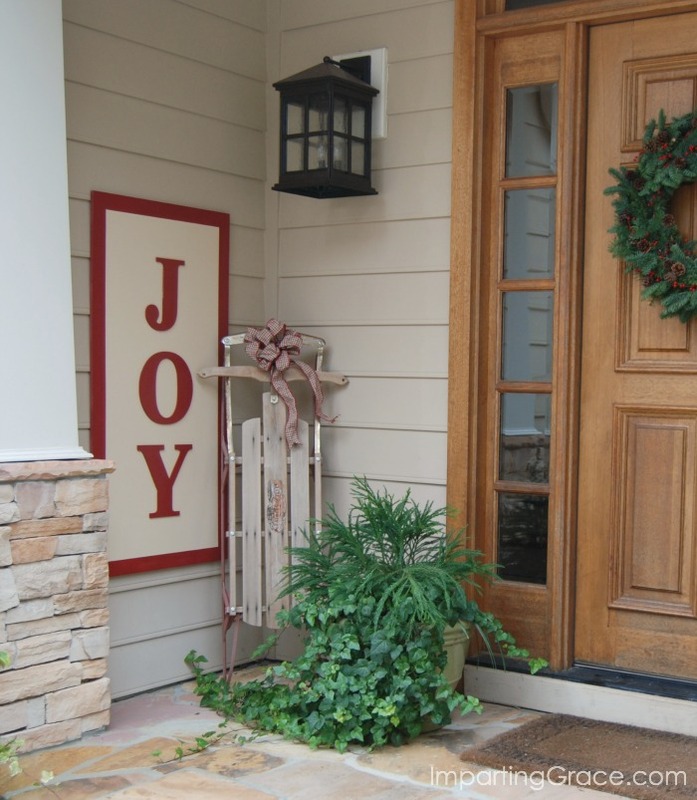 As I considered how I wanted my front door to look this Christmas, I knew I wanted to add something special. 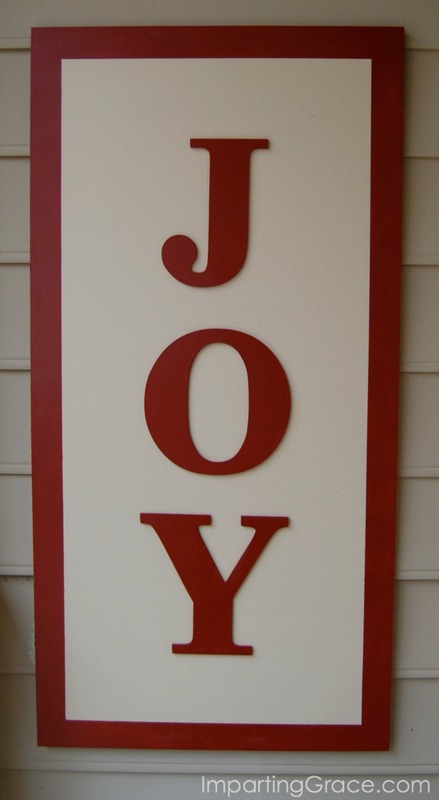 When I was window-shopping recently, I saw a beautiful sign "Joy" sign. I loved it, but it cost nearly $100, which was more than I needed to spend. You know what happened next, of course--"I could make that!" began running through my head. I headed to the craft store and found 9 1/2" MDF letters in a classic font for just $2.99 each. Perfect! But what to mount them on? The answer came when I spotted a 2' x 4' sheet of plywood at Home Depot for less than $15. I bought the 12mm board; a thinner board would work just as well. I also bought a can of Rust-oleum satin-finish spray paint in Heritage Red. I already had a can of Ivory Silk spray paint on hand. Once I assembled all my supplies, the construction was easy. I sprayed my board with Ivory Silk paint. After that dried, I used painters' tape to mark off a 2" border all the way around the perimeter of the board, and sprayed the border with the Heritage Red paint. Meanwhile, I gave the letters several coats of Heritage Red spray paint and let them dry. Then I simply used wood glue to adhere the letters to the board. Using 9 1/2" letters on the 2' x 4' board with the two-inch red border allowed me to leave about 5" of white space on each side of the letters. I mostly eyeballed the placement, using a ruler to help me get the letters spaced well enough. When I had them in place, I made some light pencil marks to guide me while I glued them down. When the glue on the letters was completely dry, my art was ready to hang! I posted a sneak peek on Instagram. Of course, the sign is pretty heavy, so I carefully considered the best way to hang it. I attached sawtooth hangers to the back of the board. On a piece this heavy, it's best to add two hangers. 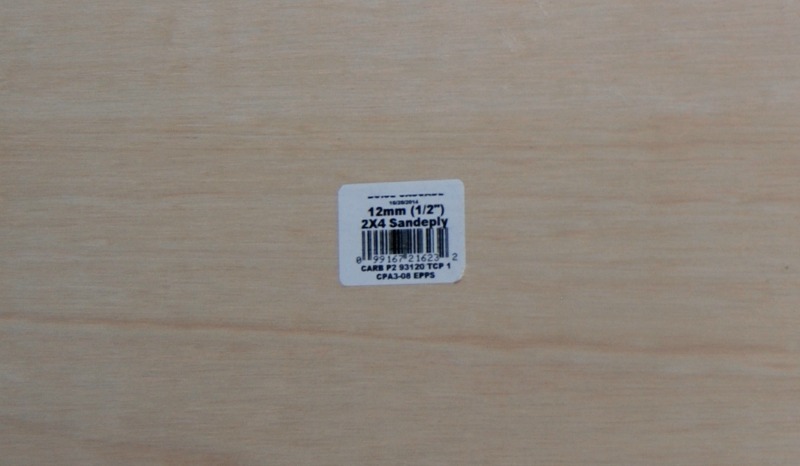 That's easy to do by using a ruler to position the hangers exactly the same distance from the top edge of the board. TIP: Place your sawtooth hanger exactly where it needs to be and mark the nail holes with a marker. Move the hanger away and tap in a long, thin nail a little way into the marked spots. Then put your sawtooth hangers in place and nail those tiny nails into the holes. With the two hangers in place, hanging the art is easy. Simply measure the distance between the two hangers, then drive two nails into the wall that distance apart. I used a level to make sure my two nails were lined up straight. Since the weight of the art is distributed evenly over the two nails, the piece is securely fastened to the wall. I love the way it looks hanging on the wall beside my front door! I propped the sled that my parents gave my boys many Christmases ago in the corner and added bow for some extra Christmas cheer. I'm tickled with the way it turned out! It should last for many years, and it cost less than $30 to complete. Now to decorate the rest of the front porch! I really L-O-ve it! I was tempted a while back by something similar for $65!! Great job! Richella, your sign is so pretty! 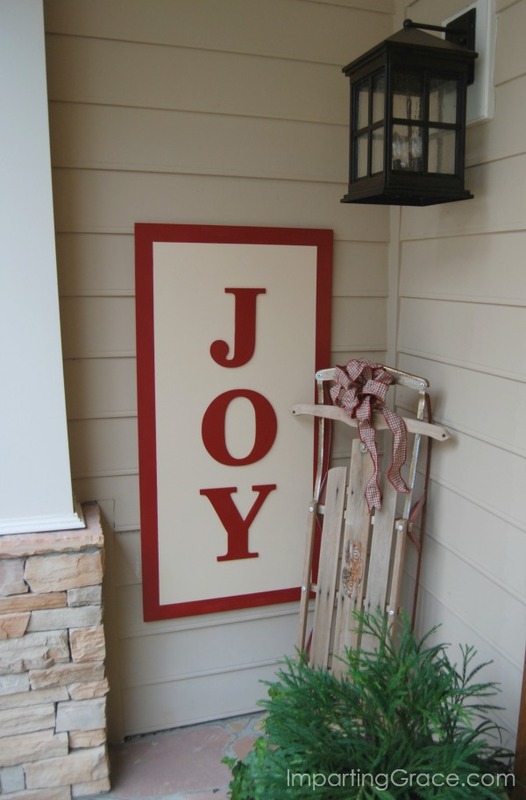 It looks great on your beautiful porch! 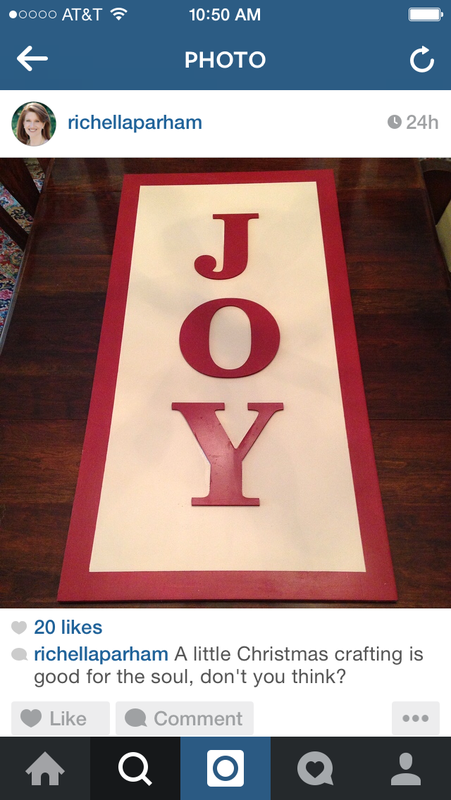 I love all the Christmas words..NOEL, MERRY, etc., but JOY is my favorite of all! I love it!! Dear Richella, You did a wonderful job on that sign! I want one too! 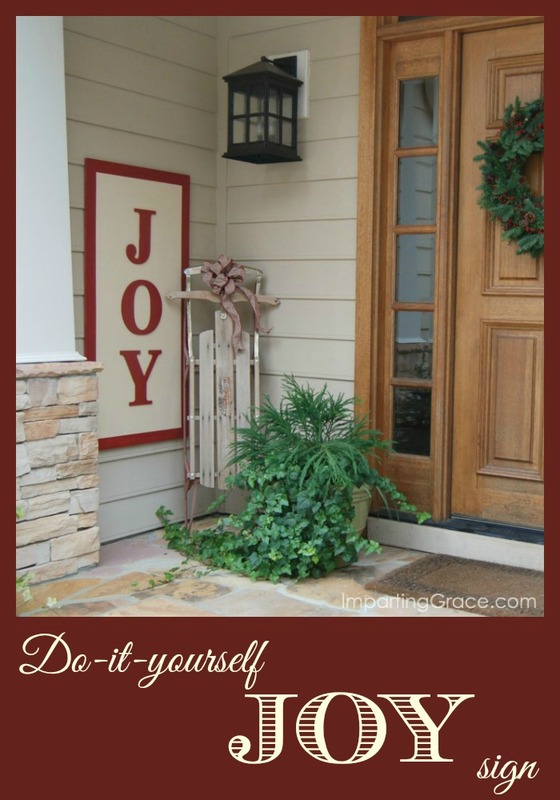 JOY that is so needed in this time of the season! And you are right, it will last for many years. Love it and I am so doing this. 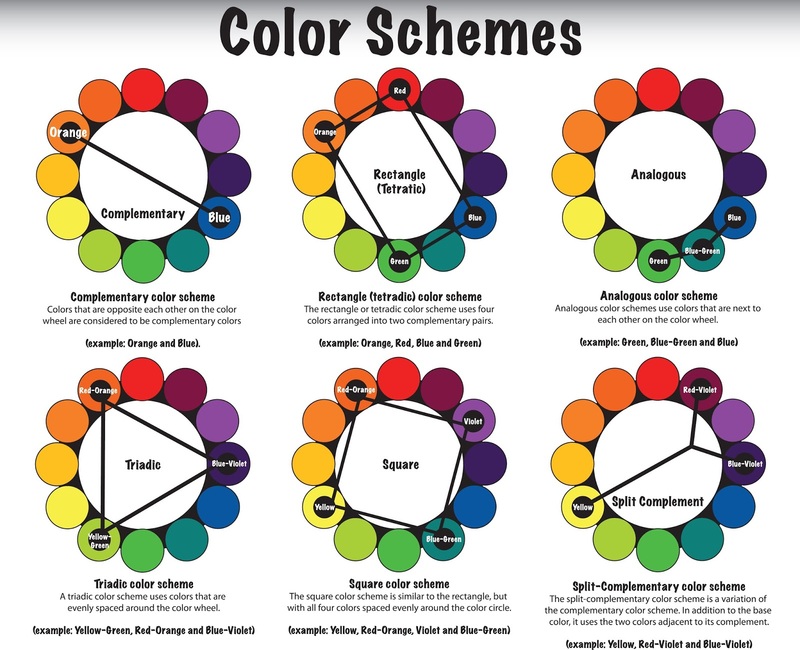 Adding it to my Christmas pin board and hope time allows me to do it this year! Oooo so cute! You just inspired me on a variation. 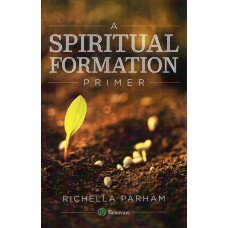 ;) Thanks so much Richella!